For centuries the tribes of the Nadir have suffered under the despotic tyranny of their Gothir overlords. Disunited and distrustful of one another the tribes await the coming of a Messianic warlord, who will unite them against the oppressors. Into this swirling, chaotic landscape come three men who will change the fate of the continent: Talisman, the mysterious, enigmatic Nadir warrior, haunted by his past and filled with dreams of finding the Uniter; Sieben the Poet, searching for the mysteries of life and love; and Druss the Axeman, determined to find two mystic gems to heal a mortally wounded friend. Together they will journey across a war-torn land, and descend beyond the gates of Hell, where a long-dead king holds the key to a secret that will change the world. The Legend of Deathwalker, this battle-charged tale of Druss among the Nadir, completes the circle begun with Legend and Druss the Legend. 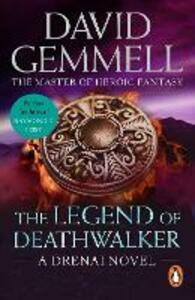 Published in 1984, David A. Gemmell's award-winning first novel, Legend, has become a classic. His most recent Drenai and Rigante books are all published as Bantam Press hardcovers and Corgi paperbacks. Hero in the Shadows, Ravenheart and Stormrider are Sunday Times bestsellers. His most recent novel, The Swords of Night and Day, is now available from Bantam Press.